A newly caught gopher (lower right) in my garden. Over the past quarter century, I’ve trapped four to six gophers a year in my half-acre garden near San Diego. If I can catch gophers, so can you. Here’s how. — Obtain at least four Macabee gopher traps. — Tie one end of a string that’s several feet long to the end of the trap opposite its pincher-jaws. At the other end of the string, tie a loop. — If you don’t know how to set the traps, watch a video that shows how. Tip: If you’re having trouble inserting the trigger wire into the little hole, use your thumbs to push down firmly on the wires between the trap’s open jaws, then thread the trigger wire up and into the hole with your fingers. As with any trap, be careful not to catch yourself! — Extend each trap’s string outside the hole and drive a stake through the loop into the ground. This ensures that you can find the trap later, that a squirming gopher can’t drag the trap deeper into the hole, and that you won’t have to reach into the hole to remove the trap. (Simply extract it by pulling the string). — The more tunnels you open and the more traps you set, the better your chances…which is why I set four traps, minimum. — Cover the trap holes, because if a gopher sees light, it’ll push dirt into the trap while trying to close the opening. I place palm-sized pieces of flagstone upright to cover trap holes, but nearly anything will work—just don’t let pebbles, leaves and dirt fall into the hole. — Check traps the next day. If they’re empty, reevaluate their locations and try again. Keep doing this until you catch the gopher or it exits on its own (evidenced by no new mounds). Sometimes—rarely—a predator gets the gopher first: snakes go into tunnels; and owls, raptors, cats, and coyotes pounce on gophers as they emerge from their holes at night. — Traps are too expensive to discard with a gopher. If you’re squeamish about such things, have someone who isn’t extract it from the trap. Shake the gopher into a plastic grocery bag, tie the top, and set it out with the trash. “Gopher spurge” in the Euphorbia genus is supposed to repel gophers (the roots exude a gummy sap gophers don’t like) but I’ve always wondered why a gopher wouldn’t simply go around them! Poison bait also is an option, but it has a shelf life, may possibly endanger pets and beneficial animals, and you don’t know for sure that you’ve caught the gopher because there’s no evidence (but maybe that’s a good thing). Use a metal bar to poke the ground around a gopher mound until the bar goes into a tunnel. Funnel bait through the hole into the tunnel. Cover the hole so light doesn’t enter. Chicken wire protects the roots of an agave from gophers. The Sunset Western Garden book suggests protecting roots of young plants by lining planting holes with chicken wire. If you look closely at this photo taken in Patrick Anderson’s garden, you’ll see chicken wire around the agave. Gophers don’t go after many succulents, perhaps because the plants are shallow rooted, but they do like agaves. 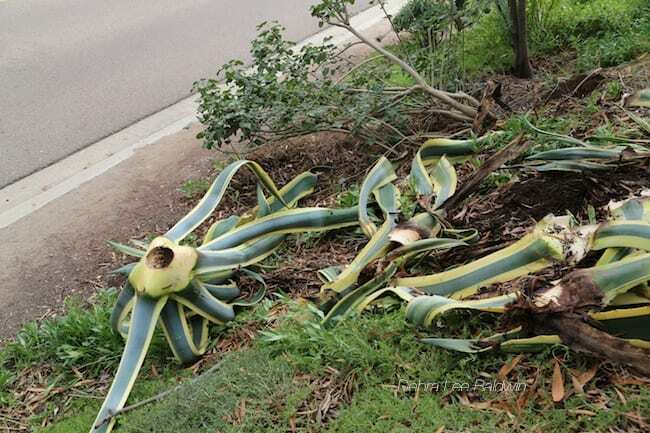 Below, my Agave americana ‘Marginata’ after a gopher ate the roots and up into the heart of the plant. Collapse gopher runs by slicing into them with a shovel, thereby making it less easy for a new gopher to use them. Gophers are antisocial except when mating, but if there’s a unoccupied network of tunnels, a new one will soon move in. Keep open a run that leads into your yard from a neighbor’s. When the tunnel opening fills with soil, you’ll know a gopher is active. Clear out the dirt the gopher used to seal the opening, then trap the gopher before it enters your garden. And no, it doesn’t help to put a hose down a gopher hole. Also on YouTube for your entertainment: Debra Discusses Gophers During a Potting Demo.